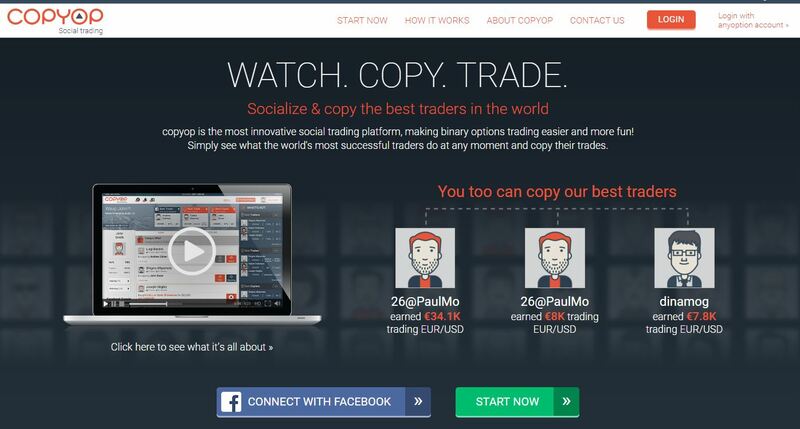 This review is about the social trading platform for binary options called “Copyop”. It is a scam. Social platforms are becoming popular with binary options, unfortunately we haven’t seen anything real so far, only scams. Copyop is one of them. The social trading platform enables you to copy other traders automatically, when they place a trade, it is mirrored on your account. Therefore your only task is to choose traders that you will copy. As we have just explained, in social trading you have to select your traders according to their statistics. And this is the main problem of Copyop, the stats are fake. Look at the picture on the right, there you can see the best Copyop traders for the last month. They are all in profit, but their hit rate does not correspond to these numbers. Because if you take an average return of 80 % on binary options, you need to win 56 % of your trades to break even and more to make profits. 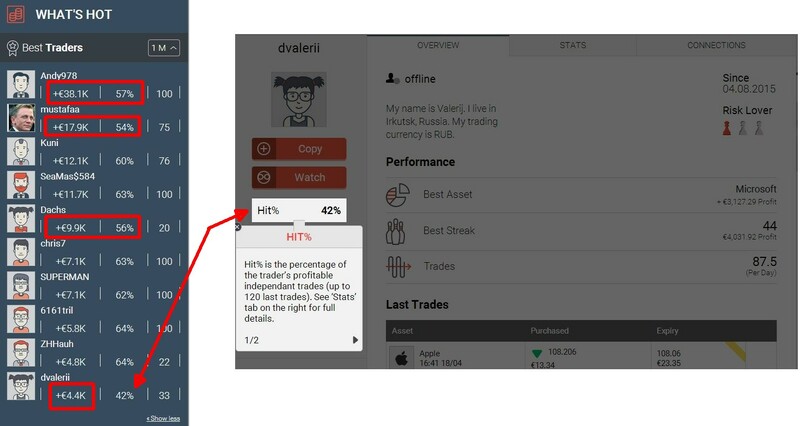 But among the best traders you can for example see Dvalerri with a hit rate of only 42 %. This would mean a total loss, not a profit. The same applies to Mustafaa with a 54% hit rate. And Dachs should be at zero, not at +€9.9K. So Copyop statistics are obviously fake. But this is not all. We have a second proof that Copyop is a scam. Look at the picture on the right. You can see the stats of a trader called Mustafaa. It shows that he is a Copyop trader since 2009. But the problem is that Copyop was created in 2014. So all the data are obviously fake. Copyop is a social trading scam, because it provides fake numbers and statistics. Therefore we have every reason to believe that you would only lose money with this system, that you even cannot try for free, they force you to deposit first. If you want to try binary options trading, do it on a demo account. There you will see that the best way is to rely on yourself and build a profitable strategy to make real money. Hi John, great review, had already heard bad things about Copyop. The broker is Anyoption, a CySec regulated broker! One to avoid I think. While I’m here, do you know anything about Tradeo, it’s a forex trader copying broker, endorsed by a scam watch site? Thanks for your great work. Hi, it seems that Tradeo is using fake testimonials, like this one: http://thebestbinaryoptionsbrokers.net/wp-content/uploads/2016/04/tradeo-testimonial.jpg But at least it is a real company. But the fact is that I have never heard of anybody making money in the long term in social trading. If they provide a free demo, you can try it, but if you have to deposit first, I would stay away. Hi John, thank you, will have a look at the testimonial video. The company seem real enough, and are CySec regulated, as I mentioned. All the same, I won’t be taking any chances. Thanks again. I’ve been using Copyop for several months now. My experience is that it is misleading. I’ve noticed that new traders will appear every week with consistently high hit rates and appear in the “Hot” list. Looking at the trader information it seems that these “Hot” traders are placing large trades with consistent success (over 70% averages) and soon pick up a number of copiers keen to profit on their success. I added one such trader to my copy list last Friday. Anyway, this trader logs in this evening and starts placing multiple Forex trades (although his average was previously showing as 3 per day) – seven of these trades close out of the money. I have some experience with reading charts and after checking each charts to understand why the trader took their positions none of the technical indicators supported the positions taken by the trader. In my opinion, it seems that it’s possible, maybe even probable, that Copyop are creating trader accounts with “traders” that are initially very successful to attract copiers. People then copy these traders and suddenly their accounts are wiped (necessitating them placing more deposits) when this “successful” trader suddenly and inexplicably goes from a consistent over 70% success rate to below 40% in the space of a single 30 min trading session, taking multiple positions counter to all technical indicators . This is not the first time I’ve seen this. There was another “Hot” trader who I copied and without any logical reason this trader kept building up a short position adding to it with a total of 14 positions although the market was trending strongly upwards with no sign of reversal. It seemed to me and is my honest opinion was that this trader was tasked with draining copiers accounts. There are some good traders on there but I get the impression that Copyop use a number of methods to wipe out profit for users. Be very careful if copying other traders. It can be a recipe for disaster and you can quickly see you’re account emptied unless you monitor it constantly. Just to add to this some of the other ‘issues’ I’ve noticed. 1. Default expiry times for trades randomly change. For example you open the trade screen in the app and expect the expiry to be 30 minutes but it will be set to an hour. I’m sure this leads to people placing trades that go out of the money if they place thr trade quickly, assuming a 30 min expiry. 2. Random freezes in price chart during trading often requiring you to close and reopen the chart to refresh it. This is something that can cause a trader to thing the price is different to what it actually is. A major red flag IMO. 3. Copied trades not expiring at correct times. I’ve seen copied trades show expiry in 30 minutes then after 30 minutes expiry moves forward to 1 hour then in one instance i had two trades expire 3 hours after original expiry, of course they expired out of the money although they were both in the money at previous close times. 4. Non existent support. Support promise call backs, emails but never respond. 5. Slippage – suspicious slippage of strike price particularly when range trading. 6. Last position size amount randomly changes – The plaform seems to be designed so that it’s inconsistent when remembering your last position size. Sometimes it changes it to the last used size other times it doesn’t. I also notice it tends to ‘remember’ the last trade amount if it is of a higher value. 7. Assets inexplicably closed and unavailable with a ‘try again later’ message although that asset is trading. If anyone else has had any other issues or problems with Any option/Copyop ID love to hear them as there’s no way for traders on the platform to directly talk to each other, which seems strange for a ‘social’ trading platform. Perhaps they don’t want traders talking as it will highlight irregularities. Exactly what happened to me last night, only opened my account last week and was doing well placing a few trades and copying a few. one guy that was 70+% who had got me in good profit all of a sudden started putting crazy trades completely out of line with previous trades and the market. Unfortunately I was busy at the time and saw he won several gold trades which got my balance up to £670 then the next time I checked 15 minutes later I had 15 losing trades on euro/usd, I’d already lost several gold and a few oil and my balance was £15!! This is enough proof for me that copyop is a scam. I’m really disappointed and just wish I had kept with my own trades as now I feel like I’m done with the stock market where as I could have done well without this scam..
Stay away from Copyop… Belive me..
I’ve made an attempt to contact them again, but this time i get no response and when i call the number back they hang up on me. The whole reason i wanted to try copyop is because i dont earn a high salary, and i want to be able to provide for my significant other and family. it may not sound like alot of money investing R1300…. but i only earn R7000. Wish someone was able to help me out now. Yeah, thats the same number i got through to. and if you call them back it directs you to cyprus apparently, i spoke to 2 different women. Both sounded american. And now closing the account is such a problem cos they still need the documents which i refuse to send. CopyOp is such a scam, they put pressure on you to deposit, and always promise you that a broker or someone who will help you to trade will call you. Which never happens, Copy a few traders on your own, for the first time your account balance wil go up, try to withdraw then they want to charge you a R400 withdrawal fee, when you continue coying the traders according to the notifications they send you, soon your account is empty, and you constantly get alerts of insufficient amount to place a trade, please deposit, at this stage it is then that you will receive a call from them again. also watch transactions into the card they linked to their system, you will notice weird name of transactions in your bank account which you never made. My advice is change your card at the bank to get a new card with new card numbers. I logged in today – my balance was £807 – I logged in a few times and noticed my balance had gone down to £247 without me trading or copying anyone! I called up – they said it was a mistake and I said I want to withdraw all my money – they said they are fully regulated and will deal with immediately – logged in again and saw just £47 in my account! Any suggestions what to do here!? – albeit may be a scam in general – the fact is it is not even trading my money! – just taking it from my balance! I am not even losing money on trades – I had £807 in my account at close of play – keeps going down by £200 – now at £47!!! I contacted them and they said they will look into it – and nothing come back to me! Any suggestions who I should report this too? Hi, Copyop is run by Ouroboros, which is a CySEC regulated company (http://www.cysec.gov.cy/en-GB/entities/investment-firms/cypriot/37622/), so you can report it to the CySEC. You can also contact the broker Anyoption, as it is run by the same company. So I should get my money back? Do you use it John? – or is it a scam? You asked who to report to that it made you lose money. So I answered. You can try to get your money back, but I guess it will be difficult. I of course am not using it, please see the reasons in the review above.